FTG Cranes develops, manufactures and markets forest trailers and timber cranes, and is one of the market leaders in Scandinavian. Since fall 2015, we have been developing and supplying complete control systems for FTG Cranes’ V crane. 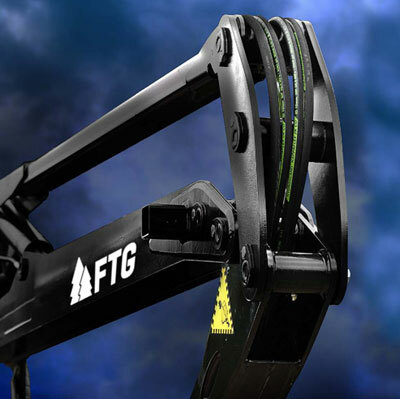 We collaborated with FTG Cranes already at an early stage of the development phase, listened to their requirements and developed a technical solution for the control system. It is not unusual for Rimaster to be involved in the entire process, from drawing board to nished system. Since fall 2015, Rimaster Development has been developing and delivering complete control systems to FTG Cranes. When it comes to purchases of a part as vital as a control system, customers naturally appreciate the security that comes from using a competent supplier who is accessible to the customer and is able to come up with solutions throughout the entire process, from development through to production and delivery. Rimaster maintains a continuous dialogue with customers and suppliers, and it is during these discussions that most new, interesting solutions are found. – In the case of customers, they often look for technological solutions and suggestions for improvements to the control system. In the case of suppliers like Parker, we cooperate on sales and our discussions in this area often lead to new, joint deals, said Ulf Almén, systems designer at Rimaster Development in Söderhamn. During one such conversation with Parker it emerged that the company FTG Cranes was looking for cable harnesses and control systems for control of the timber cranes they produce. – When we visited Parker and discussed various solutions, they recommended Rimaster as a skilled supplier of cable harnesses and software, which we needed for our V crane products. We got in touch with Rimaster, who listened to our requirements and developed a solution that suited us perfectly, said Peter Svensson, V crane sales executive at FTG Cranes. FTG Cranes, which is based in Dalsland, is the only remaining manufacturer of timber cranes for road transport in Sweden. The company manufactures around 70 cranes a year and has a market share of around 15 per cent. Peter Svensson believes that FTG Cranes has the potential to grow and gain a further ten per cent of the market within five years. – The market outlook is good and there is also potential for us to in- crease our cooperation with Rimaster further going forward. We are extremely happy with the end-result and feel our cooperation has been exceptionally good. We have several ideas for future projects that we can undertake together.